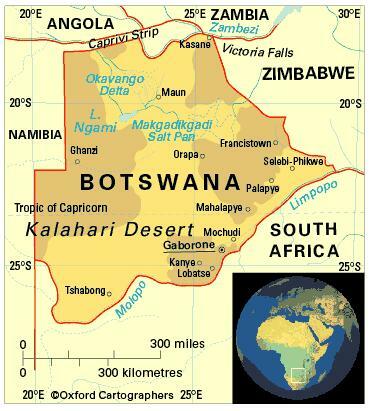 The Republic of Botswana is a large, roughly circular, landlocked plateau in the centre of Southern Africa, bordered by South Africa, Namibia, Zambia and Zimbabwe. Botswana lies across the Tropic of Capricorn. The climate ranges from semi-arid through subtropical to temperate. Eastern Botswana is temperate, with enough rainfall to support arable farming, but rainfall decreases and temperature range increases westwards and southwards. Summer (October to April) is the rainy season and is very hot. Rainfall varies from 650 mm per annum in the east to 230 mm in the south-west. May to October is usually dry. In winter the nights can be cold and sometimes frosty, especially in the desert. Mean maximum temperature at Gaborone is 32.5°C. From August, annual seasonal winds cross the Kalahari from the west, raising dust and sandstorms. The most significant environmental issues are overgrazing, desertification and limited resources of fresh water. 2,004,000 (2012); 62 per cent of people live in urban areas. The population growth rate stood at 1.7 per cent p.a. between the years of 1990 and 2012, with rapid growth in urban areas. In 2012 the birth rate was 24 per 1,000 people (46 in 1970) and life expectancy was 47 years, down from a peak of 63 years in the early 1990s, as a result of AIDS (52 in 1970). Around 80 per cent of the people are of Setswana-speaking origin and most of the rest of Kalanga-speaking origin. Bushmen (i.e. San or Basarwa), Herero, Mbukushu, Yei and Mazezuru, whites and others constitute the balance. Botswana is classified as an upper-middle income economy by the World Bank.